* Make sure your child is comfortable, not hungry or thirsty or too tired. A great place for sharing a story is snuggled together in a big armchair. That feeling of love and closeness makes the read-aloud experience even more special. * If I’m reading a print book aloud, I like to hold the book where my child can see the text while he listens, imagines, and gazes at the pictures. I believe this is an important step in pre-reading, helping kids make connections with what they hear and the print they see. * Sometimes children find it difficult to sit still for a story. Encourage them to play quietly while you read, or to move around while you both listen to an audio book. * Whenever you’re reading aloud each day - at bed time, or during lunch, or maybe while you’re in a waiting room - remember to make the experience fun. Encourage kids to join in whenever there’s an opportunity: maybe they can make an animal noise, or be a giant stomping about. * If the book is new to you, try to scan it before a read-aloud session. It helps the flow if you know what's coming next. You won’t stumble, trying to work out an unusual font or the meter of a rhyme. * I like to use different voices for different characters, and vary my tone. If I’m creeping up to a dark, scary cave, I lower my voice, read slowly and draw out the suspense. If I’m doing dialogue between a mouse and a lion, I vary my voice accordingly. Sometimes I get my voices and characters muddled, but it doesn’t matter. Kids usually point it out, we giggle and move on. 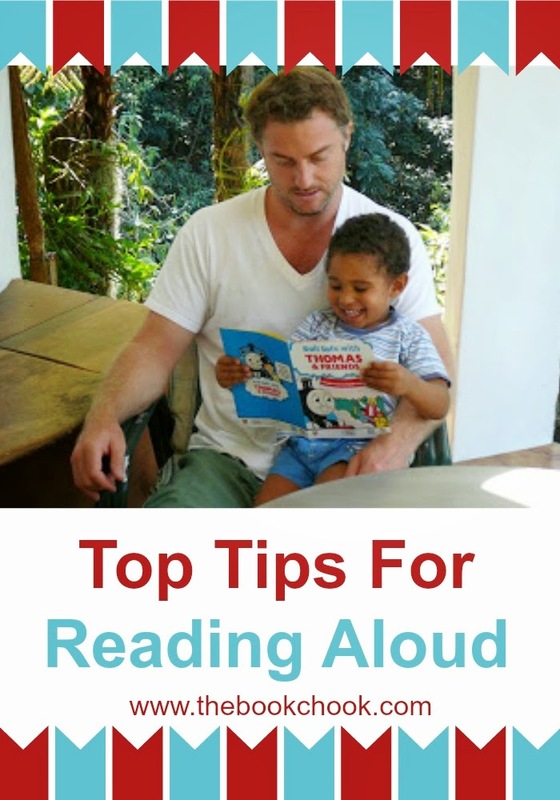 * It’s important to be comfortable and develop your own style of reading aloud. Start reading to babies - they are very accepting, and absorb a lot about language by listening to the rhythm of your words. Check out story times at libraries or schools to get an idea of what works for others. * There are thousands, probably millions of wonderful books for children. Borrow from your local library or buy from markets and stores, but make sure there are many, many books in your home for your child to choose from. Sharing great books daily will give all kids a head start into happiness and success in life, and help their dreams come true. If you're interested in more ideas for family read alouds, you might like Ten Ways to Involve the Whole Family in Reading Aloud, Fourteen Fantastic Hints on Reading Aloud by Mem Fox, Queen of Read Aloud, When Should We Start Reading to Kids?, Encouraging Young Readers, and Rhyme Helps Reading. Reading to a child is truly one of the best gifts that you can give to them, great tips! Great list! I'm adding this one to my Sunday post for sure!! Thank you! Great to read ya, Tif! My kids love it when I read with the "voices" too! Glad you linked up in WeTeach!